What is Circular Strength Training or CST? CST involves a 3 "winged" process for health-first fitness. Firstly, each joint is moved individually to restore the lubrication and nutrition to the compressed joint. Basic movements appear like standard joint flexion, extension and rotation, but then sophisticate to circles, infinities, clovers and finally waves through vibration drills and breathing patterns. Without this critical step all exercise may be harmful and counter-productive. If you’re not doing this program, you live in a state of slow decay “slowly boiling the frog” because the good nutrition you may or may not be ingesting cannot be transported to the tissues which live in a state of starvation – their joints – because of the lack of this specific program. This step – called “Intu-Flow” – is the real “fountain of youth” since we are as old as our connective tissue, and this is the only way to halt and reverse the aging process, and guarantee pain-free longevity. While restoring essential joint lubrication and nutrition, this wing of CST restores lost function, proprioception, and range of motion, coordination and agility. Secondly, the body is moved through multi-dimensional, not merely multi-planar, yoga flows and breathing drills. Conventional fitness moves only multi-planar at best: up and down like squatting, front and back like lunging and right left like side-lunging. However, the body moves in 6 “degrees of freedom” not merely 3. It does heave up and down, surge front and back and sway right and left, but it also pitches bending forward and backward, yaws twisting right and left, and rolls bending right and left. Combined the “6 degrees of freedom” create the magical grace of human movement which we all deserve to keep throughout our long lives. Prasara Body-Flow, and Flow Fit this second step, is much more than a mere athletic exercise program. It is how you regain your natural grace and poise, and all of the emotional abundance and mental clarity which accompanies it. Swinging weight was originally developed as a method for maintaining sufficient stress to the myofascia matrix when facing zero gravity and pulls the connective tissue outwards, rather than compressing it inward. The optimal tool for this job is the club, used for millennia by different cultures such as ancient Persia, India and Russia, for strength conditioning of their warriors. Clubbell training is the third step, making multi-dimensional strength, even at extreme ranges inaccessible by conventional free-weights and machines. Due to the displaced center of mass, the Clubbell can be very light weight compared to the force production it generates, making it highly portable and efficient, as well as preventing the deleterious effects that heavy weight lifting causes due to connective tissue strain. CST isn’t merely a matrix of scientific theory, nor is it just a pool of alternative exercises. It’s a health technique which has made rationally systematic and efficiently expeditious all of the benefits of ancient martial arts and health practices from around the world. And it’s been proven at all levels from the average person wanting to regain their innate beauty and grace, to the elite athlete wanting to enhance their performance in a sustainable way which guarantees their career longevity and durability. The Head Coach was introduced to CST in 2003/4 firstly through Warrior Wellness then the Be Breathed and the Body Flow programs and later to Flowfit, Prasara Yoga and Clubbells. He completed the first Circular Strength Training Instructor course in Sydney in 2008 with the creator and Master of Sports Dr. Scott Sonnon and the subsequent coaches’ course the following year. He is the only currently certified CST instructor in South Australia. Both Intu-flow and Flowfit play a significant component in Reality SDC’s low injury rate amongst club members, athletes and fighters. 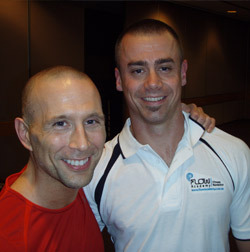 The Head Coach (on the right) and CST creator Dr Scott Sonnon on the first Australian instructors’ course, Sydney, 2008.